Born 1911, Mississippi, lived in Jefferson County, Mississippi, and New Orleans, Louisiana. George Williams participated in farm life until his teens when he left home to pursue other employment in larger towns and cities. He began whittling small heads then strung them to wear as talismans. He described the carvings as "African" inspired which people were said to believe had supernatural powers. He moved from town to town performing day work. The biography in "Black Folk Art in America," companion to the Corcoran Gallery of Art, D.C. show of the same name, describes the first time he was paid to carve at the same rate paid for his day labor. "He spent about a week carving large heads on the top of two cedar posts... to be used as gate posts." Williams said carving was something he did "in his spare time" which often resulted in the presentation of the work as a gift by the artist. The finest examples of George William's work we have had the opportunity to see were part of the "Black Folk Art in America" exhibition. We often compare collector Roland Freeman's "Standing Woman and Man" both clothed, to Williams' later work. The details of the exhibited work, dated 1977, are powerful and many. As collectors of African art, we see, especially in Williams' earlier work, features and details evocative of the Baule, Ivory Coast colonial figures we have in our collection. We had the opportunity to purchase a Statue of Liberty by Williams in 1988 from the Art Jones Gallery in Cincinnati. We purchased instead a mermaid by Earnest Patton. The Statue of Liberty was soon spoken for and part of the collection of Amos Miller and Sharon Lombard Miller. We had decided to wait for one of Williams' "couples." Williams' work is represented in numerous galleries, may be found in the Rosenak Collection in Washington D.C. and was highlighted in Alice Rae Yelen's "Passionate Visions of the American South- Self Taught Artists from 1940 - Present." 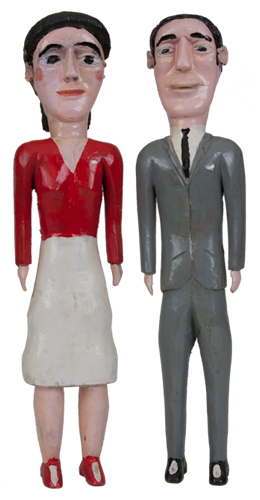 After numerous attempts at auctions of seminal folk art collections, we were able to "win" a fine George Williams couple made in 1985. The bidding was heated, in part, because it was the only example of Williams' work in the Kimball Sterling auction. Other work presented for auction that day was that of Sudduth, Finster, Butler, Doyle, Jones, Sha Ela ReEl, Hunter, .... We were relieved when we prevailed... another monkey off our backs! George Williams' work is currently (summer 2010) included in the American Visionary Art Museum in Baltimore, Maryland. The show is titled "Life, Liberty, and the Pursuit of Happiness."